LIQUID SILVER exterior and BLACK interior. Mazda Certified, GREAT MILES 18,567! EPA 28 MPG Hwy/21 MPG City! Heated Leather Seats, iPod/MP3 Input, Multi-CD Changer, PREMIUM PKG, Aluminum Wheels, Premium Sound System. AND MORE! Leather Seats, Heated Driver Seat, Premium Sound System, iPod/MP3 Input, Multi-CD Changer, Aluminum Wheels, Heated Seats, Heated Leather Seats. MP3 Player, Remote Trunk Release, Steering Wheel Controls, Electronic Stability Control, Bucket Seats. PREMIUM PKG anti-theft alarm, Bluetooth hands-free phone system, Mazda advanced keyless entry system w/keyless start, SIRIUS satellite radio w/(4) month subscription, xenon HID headlights. 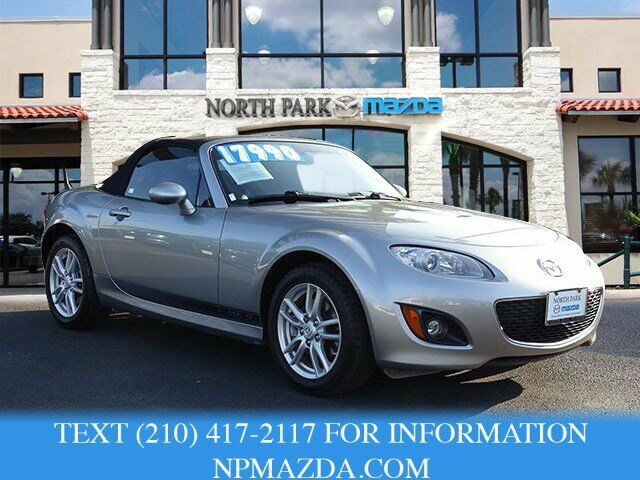 Mazda MX-5 Miata Grand Touring with LIQUID SILVER exterior and BLACK interior features a 4 Cylinder Engine with 158 HP at 6700 RPM*. CarAndDriver.com's review says "With more than 900,000 sales in the bank and still going strong, the Miata holds the distinction of "bestselling two-seat roadster, " according to Guinness World Records.". Great Gas Mileage: 28 MPG Hwy.